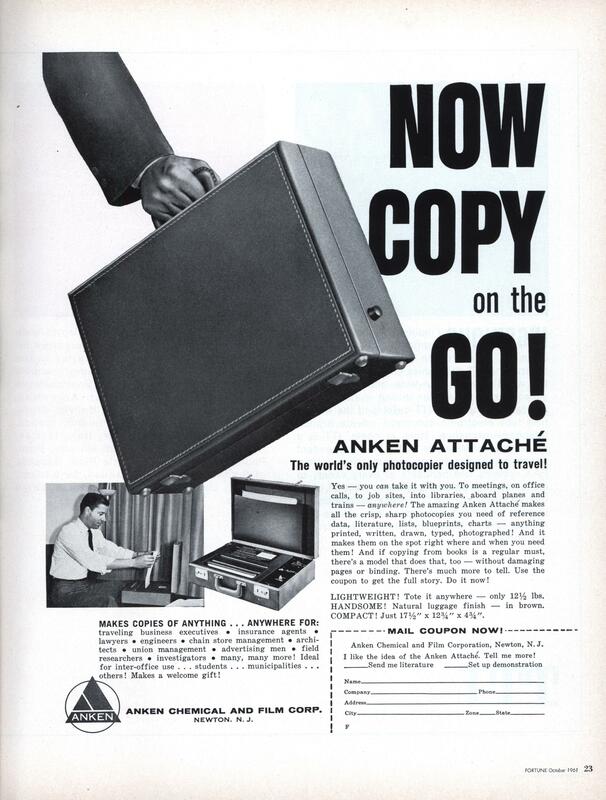 Rather than speculate Anken’s patent for a “Portable Photocopying Apparatus” may be found here. The Polaroid lawsuit I found against Anken involved trademark infringement over the name of one of their copy machines and had nothing to do with this portable copier. Reading the patent apparently a sensitized sheet and the original are exposed to light and the exposed sheet goes through development and fixing. The fact that this copier came out shortly after Xerox began offering office machines using their dry process probably contributed to its disappearance. NOW COPY on the GO! The world’s only photocopier designed to travel! Yes — you can take it with you. To meetings, on office calls, to job sites, into libraries, aboard planes and trains — anywhere! The amazing Anken Attache makes all the crisp, sharp photocopies you need of reference data, literature, lists, blueprints, charts — anything printed, written, drawn, typed, photographed! And it makes them on the spot right where and when you need them! 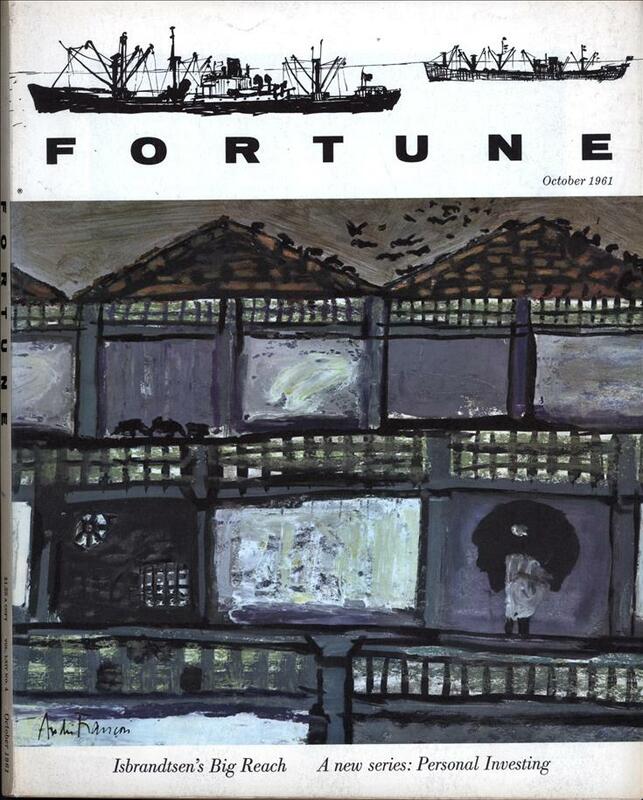 And if copying from books is a regular must, there’s a model that does that, too — without damaging pages or binding. There’s much more to tell. Use the coupon to get the full story. Do it now! LIGHTWEIGHT! Tote it anywhere — only 12-1/2 lbs. HANDSOME! Natural luggage finish — in brown. COMPACT! Just 17-1/2″ x 12-3/4″ x 4-3/4″. traveling business executives • insurance agents • lawyers • engineers • chain store management • architects • union management • advertising men • field researchers • investigators • many, many more! Ideal for inter-office use… students… municipalities… others! Makes a welcome gift! ANKEN CHEMICAL AND FILM CORP.
Neat, I wonder what kind of copying technology it uses? Judging from the flurry of law suits over the process in the early 60s, I would say it was similar to a Polaroid picture. Well as long as it’s not a thermal copier. Those were common in Eastern Germany (the communistic part). Essentially they had a large lamp heating up your original. The dark parts would heat up more than the bright ones, and you’d then transfer the heat to a piece of thermal paper. If there was a paper-jam your paper would start to burn.